Johan Marais was born in Kimberley on the 8th of October 1948. He took his first art lessons at the Diamantveld High School, during which time he received several awards. After matriculating he studied art extra-murally, and then decided to study for a B.Com at the University of South Africa. After obtaining his degree, Johan Marais resolved to improve his art and took classes under the tuition of Christopher Haw, an accomplished artist from Natal, concentrating on landscapes. Over the years Johan has not limited himself to use one medium. He has qualified himself further, using oils under the tuition of Rina Badenhorst, a well-known artist from Port Elizabeth, and Vivian van der Merwe of the Central Art School in Port Elizabeth. Johan Marais, who had a full-time job, painted part-time, a hobby he obviously enjoys and spends a great deal of time exploring. He is at present focusing on flowers, still life studies and Landscapes. Johan Marais is very fond of nature, from which he gets his inspiration for his new work. His renditions of flowers, stems from the fact that they are those things in nature which he sees in harmony, something not easily seen or found when portraying humans. His preference is to use bright, fresh colours in his works. Johan Marais says that people need colour in their lives, especially as sometimes everything around us appears to be so dull. Johan Marais has partaken in various group exhibitions in South Africa and he has also exhibited in Austria. He held his first solo exhibition, titled “Harmony”, comprising of oils and watercolours, at the Cyler Gallery in Port Elizabeth. Johan attributes his success to the love and support he receives from his daughters, Marlize and Lynette. Johan Marais has in the interim moved from Port Elizabeth to Pretoria where he held his second and third solo exhibition at his home studio and also at Woodlands Estate. He also partook in group exhibitions since his move to Pretoria. The resent group exhibitions were held at the Artcoza gallery during January 2004 and Woodlands health Estate during May 2004. 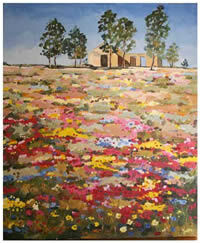 Johan Marais also attended Master Classes at the Association of Arts in Pretoria presented by Andre Naude during 2003. During 2004 and 2005 Johan’s work was selected for Alette Wessels Kunskamer Annual Art Initiative. During 2004 he was one of the finalist for Johannesburg Art City Competition. 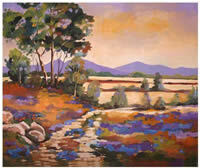 Johan Marais focus is at present on Landscapes and still life studies. His Artwork is currently exhibited in several Art Galleries in Gauteng. 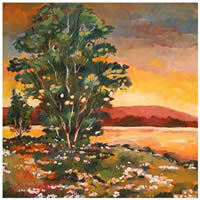 Johan Marais retired in March 2005 to work full time as artist.